This fall, my husband and I hosted our first-ever Oktoberfest gathering, which included every German sausage and beer known to men in lederhosen. With online ordering and a couple of trips to a specialty German butcher, the preparation was rather quick and easy. But we still needed a German dessert for a lot of people. Well, when I did my research, I realized that “quick and easy” doesn’t apply to most authentic German sweets. They are very delicious, but they take some amount of time to prepare. Fast-forward to today. Oktoberfest is long gone. But my memory of those German deserts lingers and despite the time they take to make, I am digging into them again as the Advent Season approaches. Although much of Germany today is secular, the first weekend of Advent is embraced with eagerness and joy. The Christmas markets are in full swing, wreaths are lit and the much-anticipated Advent baking commences. The preparations for breads, cakes and their most favored Plätzchen, or Advent cookies, are made in advance, sometimes even before the Advent season begins! For the cookies, making the dough and freezing them to bake throughout the season is necessary, since they are enjoyed on Sunday afternoons during Advent and at Christmas. There are several different cookie recipes ranging from simple (like the one below) to more complex. Some require the dough to rest or cure for weeks before baking for enhanced flavor and texture. Conversely, there are varieties that soften and taste better long after they are baked. Even today, with hundreds of different cookies available at the Christmas markets, many German families will bake at least one or two batches at home, while others will bake several to give as gifts or display on a table for guests. All in all, they are a labor of love and require patience. Perhaps such traditions can be a valuable lesson for us all, and help us think differently about the true meaning of Advent, especially in our modern age of instant gratification. Waiting for God to fulfill his promises of a coming Messiah wasn’t exactly “quick and easy” for his people. It took centuries! And while German pastries don’t take centuries, they do take some amount of time, preparation and patience. What a perfect metaphor for the Advent season! Preheat the oven to 300 degrees. In a medium-sized mixing bowl, beat egg whites on a high speed until stiff peaks form. Slowly add confectioner’s sugar and continue to beat until combined. The whipped (stiff peaks) texture may become creamier, and that’s fine. Reserve 1/3 of the meringue mixture for the glaze. Add the almond meal, cinnamon, lemon zest and salt to the meringue mixture. Mix until the dough becomes stiff. If it's still too soft and sticky, add a bit more of the ground almonds. Place the dough in the fridge for an hour, so it will be less sticky to work with later. Between two sheets of parchment paper, press (with hands) and then roll dough to a thickness of about ¼ inch. Using a star cookie cutter, cut out the cookies and transfer to a parchment-lined cookie sheet. 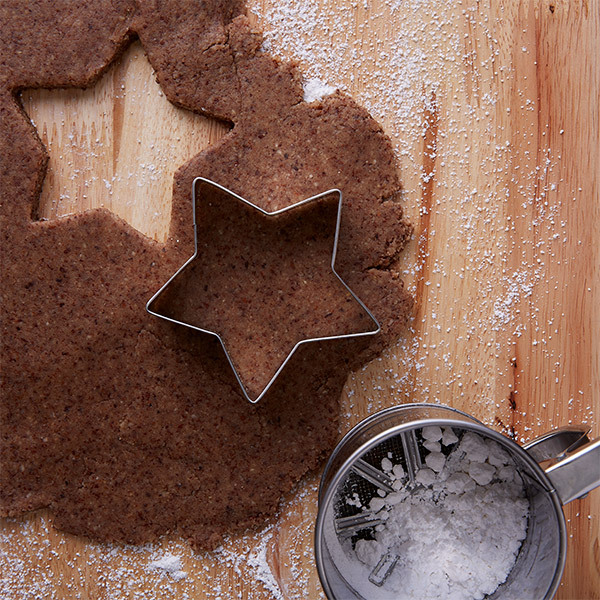 You may have to gently push the star shapes out of the cookie cutter onto the cookie sheet. Re-roll scraps of dough and repeat process. Bake for 15 minutes or until cookies are set. Do not overbake, since the meringue glaze will start to brown. Remove from oven and let cookies harden and cool on cookie sheet. These can be stored in a dry, airtight container throughout the Advent and Christmas seasons!